Looking to take a shot at the traditional confidence football pool? OfficePoolStop.com is the place to be! We have NFL and NCAA confidence pools with a number of different features to keep you entertained. We offer comprehensive statistics based on your individual performance and a chance to have your name listed in the Hall of Lame and/or in the Hall of Lame! Start today! Each week you pick a winner for every game, and place a "weight" on each game from 1 to 16*. The more confident you are in the pick, the higher points you give to that team. For each win you get the points you assigned the pick. The player with the most points during the week wins any configured weekly prizes. The player with the most cumulative points after the season ends wins the league. Easy pick sheet that allows you to either drag&drop teams to the desired weight, or manually enter in the weights. 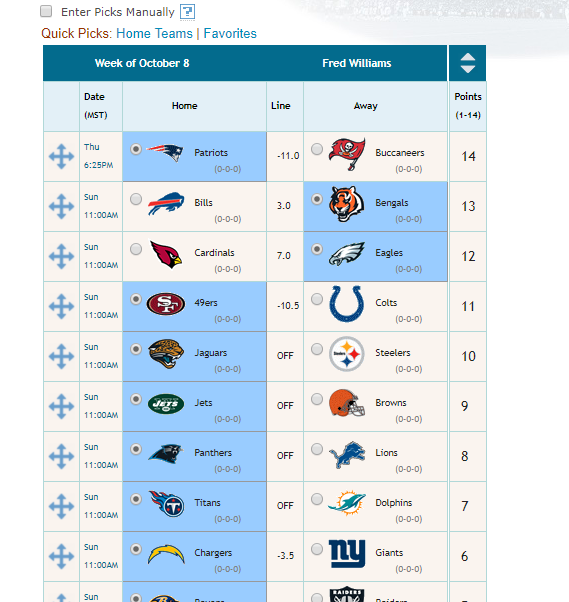 Pick sheet quick pick option to select all home teams or favorites. Standings page that includes win/loss pct, total points, weekly trends, strength of victory, and player's picks for that week. 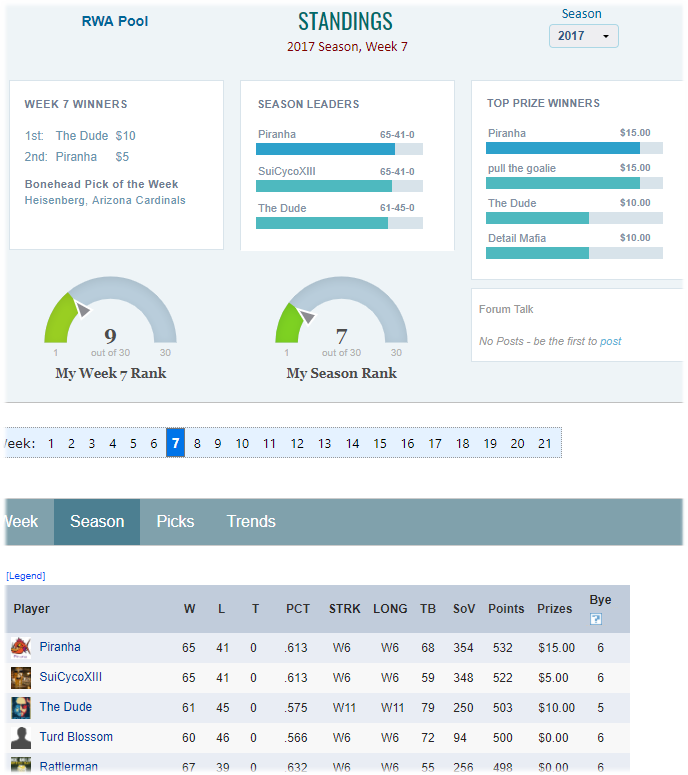 The Standings page also inludes the wekly winners (if configured). Comprehensive, life-long stats on your confidence league and your individual performance. Trophy case for all past 1st through 3rd place finishes across all leagues. Possible inclusion in the Confidence Pool Hall of Fame and Hall of Lame. Option to also subtract weight placed on game or a fixed amount for losses. Specify your own weight values for post-season games. Specify weight value lost for games that are missed (e.g. Thursday night game not picked). Specifying an exact number of weekly confidence games to pick (default is all games). Selecting which games your league picks each week (default is all games). Option to set your football confidence pool to be straight up or against the spread. If against the spread, the line can be set to variable (palyer gets line at time of his pick), or fixed (all players get the same line). Weekly prizes from 1st to 3rd place. Final season prizes for 1st through 4th place, best total tie-breakers, and best overall Strength of Victory. One custom prize, where you name the prize, and set the winner when appropriate (for example, "best football picks in December"). "Bye" week feature that allows a player to forget a week and not be hopelessly out of contention. If enabled, the worst regular season week for each player is subtracted from their total points (only total points are affected, other stats such as win-loss record remain intact). The Standings will indicate the bye week determined for each player. Tracking of player league fees, per-player note annotation (e.g. "this player gave me a check"), and optional notification to the player when they log in to the site if they have a balance due. You can also configure your confidence pickem pool to be weekly, where weekly cost for a player is updated only for those weeks they submit picks. Ability to accept credit card payments onlin for your league fee. Branding your football pool to look like your own by choosing colors and using your logo. You also get your own branded login page. * - For bye weeks, the weight options are 1 to the number of games that week.